← Impact of Brexit on 2 Million Expat Brits & Other Major Issues. 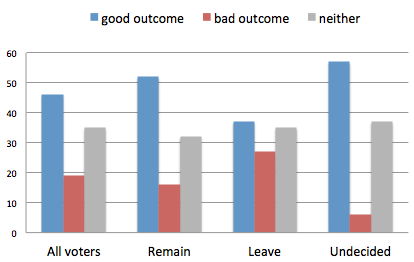 The importance of the “deal” the Prime Minister may secure with Brussels is demonstrated by the result, with “Undecided” voters breaking more strongly than anyone (see chart below) in viewing it as a good outcome – 57% taking this view but only 6% viewing this as a bad outcome. With the “Leave” and “Remain” campaigns already promoting their conflicting messages, but the final result still in the balance and sensitive e.g. to the intentions of the “undecided” voters (or indeed the estimated 5 – 6 million British expats worldwide), shouldn’t you as a British citizen resident abroad (for less than 15 years) finally decide to register to vote in this referendum? This entry was posted in All EU Brits Need Voice, Brexit Impacts 2 Million Expat Brits!, British Expat franchise not rigging EU Ref., EU Ref Votes for Life Response, EU Ref: Overseas Electors - Counter Arguments, Expat Voter Registration, Harry Shindler Presses PM., Undecided Voters in EU Referendum and tagged 15-year-rule, British expatriates, EU Referendum, voter registration. Bookmark the permalink. 1 Response to Undecided Voters Could Decide EU Referendum! David Cameron embarked on this Ref. issue / new conditions with EU because he is following the same line as Maggie . DC believes he could become a world statesman by changing EU – fat chance – thats why he’ll lead UK down the plughole by curbing citizens rights and creating a London only UK centralised Gov. – crocodile tears re Brexit and the rest of UK . ‘Better together’ for Scotland – he conned Labour / Libdems and a lot of UK Citizens on that one !.